Sold pens: yes! Can one of these sold pens be recreated? YES! Not exactly, but as close as I can with out using duplicating machinery. I can use the same wood, a different wood, an acrylic or antler to make a pen similar to any in this sold gallery or anywhere else on this website. At Red River Pens I am pleased to offer quality handcrafted works of art. Each pen is made using the finest materials. By handmade I mean that no duplicating jigs or tools were used and each pen is a unique work of art turned on a wood lathe from a piece of wood or acrylic. Only hand held tools are used. 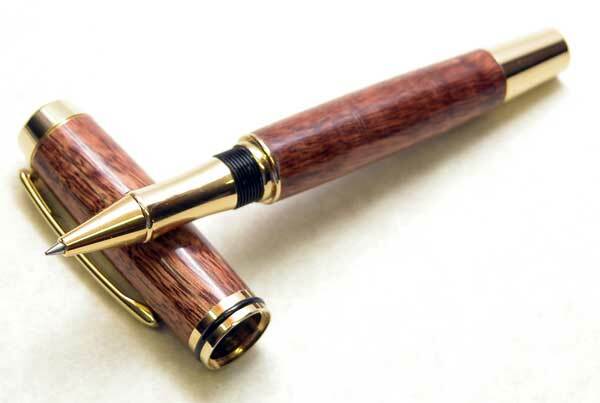 I would also be honored to make any of my pens from wood furnished by you, the customer. Pens made from sentimental wood soon become family heirlooms. I have made pens from baseball bats, bowling pins, Christmas tree trunks, flooring, furniture parts, wood from trees from family homesteads, solid surface counter top material, and other pieces of sentimental wood too numerous to list. Contact the me at the address below to discuss a truly custom pen or the possibility of using your unique material. Another service I can offer is custom engraving using a laser. Names, logos, line drawings are all possibilities. Quite extravagant engravings can be done with lasers. Contact me for more info on laser engraving. I don't do the engraving, but the engraver I use is incredible. Multiple pens orders for corporate gifts to investors, gifts to special employees, and pens for other special occasions are all possible. The following pens were have all been recently on the website but have sold. See one of these that you like? Contact me and I can make you one very similar to it...or we can change such things as the wood, the finish, or the metal platings.